Leave the world behind, cross the ever turbulent Dreaming Sea in search of the legendary Forsaken Mountain, for here, upon the ruins of time lies the Vessel of Souls, a high level adventure module for Castles & Crusades! For the first time in many long years, a cold wind blows from Aufstrag. The Ahargon Den, The Great Maw, the gates of Aufstrag, have opened and a host issued forth. Lord Coburg the Undying, Master of Aufstrag, self-appointed heir to Unklar Dark Heart, has sent forth his servants. Rumor spreads across the land, far and wide, that they seek the Vessel of Souls. But all know the legend of the Vessel of Souls, stolen by a Confessor Knight before the Winter Dark War�۪s end and borne upon a wind of desire across the Dreaming Sea; there the thief set it at the base of the Forsaken Mountain, safe from all hands who would misuse it. This vessel, possessed of wondrous power must never fall into the hands of the enemy, for if it does, the power in Aufstrag must surely bend its will into the lands of the Empress. 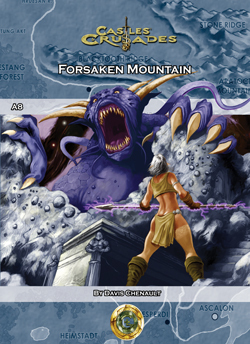 The Forsaken Mountain follows the adventures in the A series developed by Troll Lord Games, however the adventure can be used as a stand alone should the Castle Keeper desire. The characters must travel far beyond the realms of man and cross over into the land of dreams and thence into the realms of the forever dying, where creatures both horrifying and ambrosial dwell. Only the bravest can survive here for one's fear will certainly be one's undoing.